Welcome to the final installment of Chic Pixel’s Ultimate Guide to Blogging! In the first week, I gave tips on how to start a blog and narrow your blog’s focus to fit into a niche that’s perfect for you. The second week was full of specific post ideas, and how to keep going when the going gets tough. Then, in week three, I shared my favorite social media strategies and tips for cultivating an audience who will keep coming back to your blog. For my final post, I’ll be tackling a somewhat touchy subject: making money off blogging. Can you earn a living off your blog? When, if ever, should you start trying? How can you ask for money without seeming tacky? I’ll be covering everything from affiliates, Patreon, ad revenue, and selling your own products. Plus, I’ve teamed up with Lauren Orsini from Otaku Journalist to give away a copy of her Affiliate Linking for $$$ Guide! Read on for details! Unfortunately, there is a bit of a stigma when it comes to creators earning money off of their work, especially when it comes to things they offer online for free. You’re not putting your blog behind a paywall, so people are used to reading your posts without paying a cent, and ads are often seen as gaudy and obtrusive. If you’re the owner of a small to medium-sized niche blog, is it even worth the hassle to try to earn money from it? 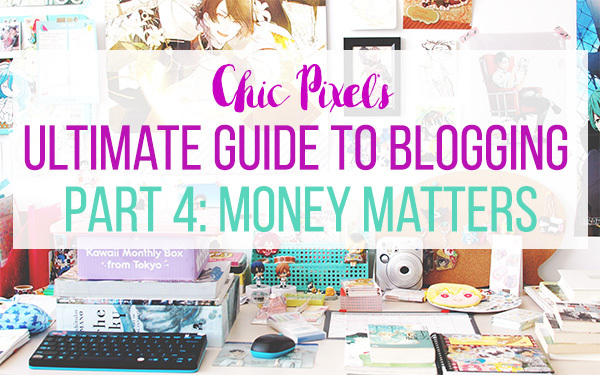 I’m obviously biased, because Chic Pixel utilizes a number of forms of monetization, but I believe anyone can and should work towards a blog that earns some form of income. You spend countless hours crafting posts, sharing them on social media, and interacting with readers and other bloggers, and your expertise should be compensated! The dream for a blogging fanatic such as myself is to someday make this a full-time gig, but the reality is most of us will have to settle for some extra pocket change, or scrape by with just enough earnings per month to pay for things like hosting fees and other site-related costs. 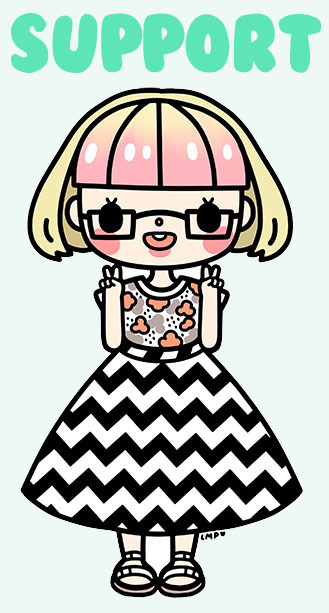 Even if you do decide to take the plunge and quit your day job, you’ll probably need to supplement your blogging income with other freelance jobs, such as Lauren with Otaku Journalist. But just because you probably won’t strike it rich immediately doesn’t mean you shouldn’t give it a go! If you have developed a quality blog with an audience that appreciates what you do, there will undoubtedly be fans who will be happy to support your endeavors with money, either directly or indirectly. As I alluded to at the end of my post on building your audience, I don’t believe your site needs to be getting insanely high pageviews to be successful. As long as you have readers who you interact with on a regular basis, you likely have what it takes to earn a few bucks. While it may turn potential readers off if you start a new blog and start heavily pushing affiliate links and ads day one, there’s no reason not to get started while your blog is still young. Not everyone who frequents your blog will want to or be able to support you monetarily, but with things like affiliate programs, where you earn a commission when someone purchases an item from clicking a link on your site, there are ways to earn money indirectly, too! I’ll begin with affiliate programs since it’s the easiest way to start earning money as a blogger. Some existing online marketplaces, such as Amazon, have programs where you can sign up for your site to be an affiliate. Once you’ve been approved, you receive a unique tracking code so that every time you direct someone to said store, you’ll receive a small commission if they decide to buy something. The most effective way to use affiliate links is by linking to relevent products within the body of your posts. For example, in my review of Poochy & Yoshi’s Woolly World, I include a link to the game on Amazon so if anyone reads my review and decides to buy it from them, I receive a commission. You can also share affiliate links on social media, which I do by sharing new products I’m excited about or sales worth checking out. Just remember to disclose that they are affiliate links! My rule for affiliate programs is that I will never promote links to a store that I do not personally shop at. You wouldn’t want to push your readers to buy somewhere only for the service to turn out to be horrible, would you? I actually canceled an affiliate account I had with a company a couple years ago after I found out they were promoting things I really did not agree with on their social media accounts. The main issue with affiliate programs is they can change their rates or shut down completely at any time, making them a somewhat unreliable revenue source. Regardless, if you can find a site offers products are relevent to share with your readers and has an affiliate program, it can’t hurt to try it out! Amazon – Amazon is one of the biggest online retailers, so it goes without saying that their affiliate programs is one of the most promising. Unfortunately, however, it’s not available in all countries, and the US and Japan Amazon stores definitely trump pretty much everything else (Amazon Australia, for example, only offers Kindle products). If you’re lucky enough to have access to the Amazon Associates program (their name for their affiliate program), I highly recommend signing up. You will earn 4% commission for your first 7 sales, after which it will bump up to 7%, and you can elect to be paid in Amazon gift cards or directly to your bank account. For tips on how to make the most of the Amazon associates program, I recommend this informative episode of ProBlogger’s podcast. 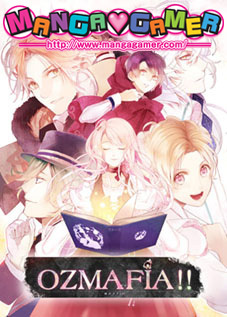 CDJapan – While Amazon has an amazing range of products, I’ve found that CDJapan has been great for my specific niche, particularly Japanese otome games! Since it’s a Japanese store, they offer a lot of merchandise that can’t be found elsewhere at reasonable prices. CDJapan offers 5-7% commission depending on how many sales you get per month, but you can also earn commissions from your own purchases (which Amazon does not allow), and you may choose to receive your commission in CDJapan points or Paypal. Tokyo Otaku Mode – Tokyo Otaku Mode has frequent sales, an extensive points system, and free shipping for orders over $150, making them a great affiliate option for Japanese pop culture bloggers. The downside to their system is they do not have the ability to link to specific products yet, and they only send a monthly report rather than allowing you to see how your links are doing in real time. However, you’ll earn an 8% commission for all purchases, which is a very good rate! Jlist – The best commission rate I’ve found related to my niche, however, is at Jlist: they offer a whopping 10% for all sales! The payout threshold is $25, which is the lowest I’ve seen, as well. Jlist offers a wide range of anime-related merchandise, as well as Japanese snacks, games, and some NSFW products, too. Unfortunately, I’ve had some issues with them in the past (delayed/lost packages, frustrating customer service), but they’ve always resolved things eventually and my links continue to do well, so I’ve decided to stick around. Be sure to have a look around for stores that are relevent to your own niche and see if they have affiliate programs! [Giveaveay closed] To get an even bigger jump start on earning money as an affiliate, comment on this post with a sentence or two about what niche your blog caters to (or what you would like your blog to be about if you haven’t started one) to be entered to win a PDF copy of Lauren Orsini’s Affiliate Linking for $$$ Guide! One lucky winner will be randomly selected on Tuesday, March 14th at 9 pm EST. When I started blogging, Patreon didn’t even exist! But these days, it’s easy for creators to set up a Patreon account to earn money for pretty much whatever you want to get paid for. 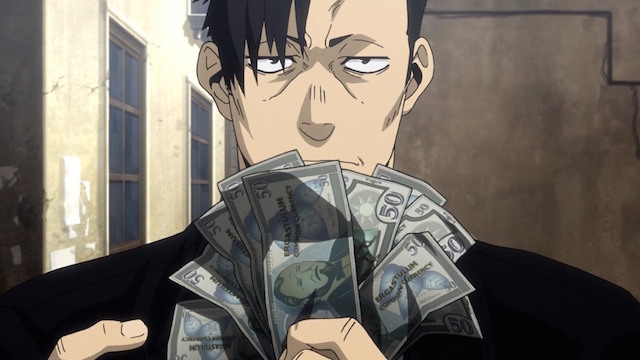 A lot of bloggers have Patreons now, but I haven’t used it due to the fact that it’s usually customary to offer pledge incentives of some kind and I don’t feel I have the ability to do that at this point in time. If you do decide to give Patreon a go, it’s important to remember that Patreon as well as Paypal deduct fees from your monthly pledges. For some examples of successful Patreons, I suggest checking out Anime Feminist and Tiny Cartridge. In lieu of a Patreon, I have a Paypal donate button that people can use whenever they feel like tossing a few bucks my way. It can be an easy alternative to a more structured service like Patreon, but the revenue is pretty inconsistent. With both Patreon and donate buttons, you’ll need to be sure to remind your readers you have them through social media or in the body of your posts, or it’s likely they won’t even notice they exist. Another method of monetization I’ve tried with varying degrees of success is advertisements. There is, of course, Google AdSense, but I personally have stayed away from it due to the ads really turning me off whenever I see them on other sites! Plus, it takes a lot of pageviews to earn money from traditional banner ads these days. Ads specifically catered to your audience that you personally negotiate with relevent parties, however, may be worthwhile. I have done one large takeover ad at Chic Pixel before, and that paid very well because it wasn’t based on clicks or impressions, but I was also approached by the company because I blogged about things that were related to their product. That’s only happened once in 6 years of blogging, though, so I’m not holding my breath for another opportunity! 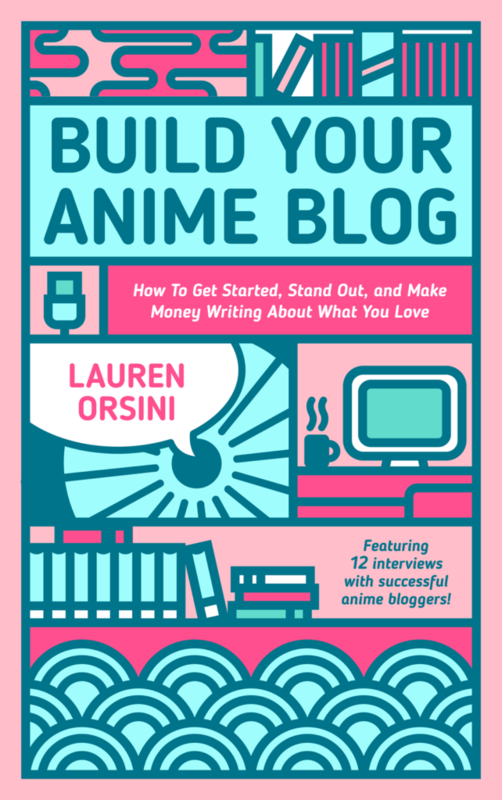 Another way to earn money through blogging is by making your own products to sell, like Lauren Orsini’s ebook Build Your Anime Blog! While bloggers 10 years ago may have made careers out of ad revenue alone, these days everyone is talking about the power of creating and selling your own products. Think of it this way: if you have a blog, you already write a ton. Why not publish an eBook and place an ad for that in your sidebar, instead of an ad for some other site or product? The initial time investment will be high, but once you have a great eBook under your belt, you can recommend it to everyone who visits your site. Unfortunately, I don’t have firsthand experience with this myself yet, but it’s very high on my list to do after I’ve completed my thesis and have a little more time to dedicate to the site. I’m already brainstorming ideas for my first eBook! Lauren has published two directly related to topics she covers extensively on Otaku Journalist, Build Your Anime Blog and Otaku Journalism. If you can rework something you’ve written about on your blog before, you’re already partway there! While it may seem counterintuitive to charge money for something you’ve written about for free in the past, find ways to add value and make the eBook version the most comprehensive/compelling option. If a whole book sounds too daunting, you could always make a shorter product like a workbook. There are also ways to offer products on your site that aren’t eBooks, such as webinars, consulting services, and pretty much anything else you can think of! For example, since I do freelance Japanese to English translation, I could advertise that more actively here when I’m in between projects to help get the word out. There are so many options! I hope this post has given you some ideas on how to start earning money off of your blog, because you deserve it! At the very least, make it a priority to sign up for one affiliate program and start finding ways to work those links into your posts and social media without inundating your readers. Don’t be discouraged if you don’t see big results immediately! I just joined Amazon affiliates at the beginning of this month due to previously being unable to because of convoluted tax reasons. So far, I’ve made exactly… $3.08. We all have to start somewhere! Don’t forget to leave a comment on this post about your blog’s niche for a chance to win a PDF copy of Lauren Orsini’s Affiliate Linking for $$$ Guide! Giveaway closes March 14th at 9 pm EST. If you’ve made it this far, I’d like to say a huge THANK YOU for reading Chic Pixel’s Ultimate Guide to Blogging series! This was my first time doing a multi-post guide, and I had a lot of fun writing it. Please feel free to leave a comment or shoot me an email and tell me what was most helpful for you, and if there was anything I didn’t cover that you would like to see a post on in the future! If you enjoyed this series, I would greatly appreciate it if you considered supporting the site by shopping at my affiliate links or sending me a small tip. Happy blogging!